Vegas is synonymous with many things such as glitzy shows, rowdy bachelor parties, and arguably the best casino gambling in the world. Intertwined with all those, however, is the all-you-can-eat, gourmet food that accompanies it. With their endless (and bottomless) options crisscrossing countless culinary styles, Las Vegas casino buffets have taken on notoriety and a cult following of their own. It’s now to the point where it can be overwhelming trying to decide just which of many options you want to enjoy endless crab legs, in-house smoked meats, and build-your-own Bloody Marys. Our Las Vegas casino buffet guide will help you navigate the seemingly limitless amount of places where you can enjoy an actual limitless amount of food and drink. What’s Unique: Being the biggest buffet in Vegas (and widely considered the best), it’s no surprise that the Buffet at Bellagio also offers the widest variety of food from around the world. The cuisine ranges from traditional American to Japanese to Chinese to Italian, to everything in between, and much of it is prepared at live cooking stations right before your eyes. 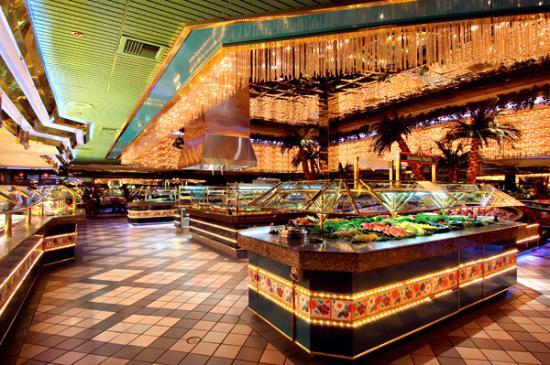 It’s also particularly renowned for its seafood, widely regarded as some of the best in Vegas, buffet or otherwise. Cost: Weekday breakfast starts at $20.99; lunch at $24.99; dinner at $35.99. Prices are slightly higher on weekends and you’ll pay $30.99 for the weekend brunch; $43.98 for the unlimited champagne brunch; and $40.99 for the gourmet dinner. The special Chef’s Table at the Buffet costs an additional $25 on top of your meal price (details below). Prices and meals may vary during holidays. Special deals: The Buffet at Bellagio offers a dinner experience unlike any other called The Chef’s Table. It requires that you bring a party of at least eight, but at an exclusive table, you’ll receive custom offerings from both the Executive Chef himself and a tableside carving station. Reservations are required and the experience is offered daily from 4:00 PM-10:00 PM. Style of space: While elegant, the decor is a little dated as far as Bellagio standards go. Just as well, the dress code is considered casual even though you’ll eat like royalty. What’s Unique: Voted the best buffet in Vegas by USA Today, the re-imagined buffet at the Wynn serves up a selection of international cuisine from 15 different live-action cooking stations. There’s up to 120 dishes available to try at any one time, ranging from ‘typical’ Vegas fare (boat loads of seafood and meat options) to more trendy (including a wide array of vegan options). Possibly most famous are its massive dessert spread of nearly 40 different rotating selections. Cost: Prices at the Wynn are pretty typical as far as the best Vegas buffets go. Breakfast will cost you about $23.99; lunch $26.99; dinner $42.99 Sundays thru Thursdays; $49.99 for the Friday/Saturday gourmet dinners. The Saturday and Sunday champagne brunches are $34.99. Special deals: The Buffet at Wynn offers two different dinner and show options. For $180 per person, you can enjoy the buffet and all it has to offer along with Le Rêve – The Dream, voted the Best Production Show in Vegas for five straight years for just $180. For $148 per person, you can also enjoy the buffet and Steve Wynn’s ShowStoppers, a musical spectacle comprised of a cast of 66 talented singers and dancers. Style of space: The buffet’s decor lives up to the Wynn name and features ornate white pillars, creative centerpieces, and large floral arrangements. The elegant and colorful dessert spread could be considered a work of art in itself. What’s Unique: Le Village is a travel experience as much as it is a dining one. Five different provinces of France–Provence, Alsace, Burgundy, Normandy, and Brittany–are brought to life through both taste and decor. Each region and their live-cooking stations all serve up different French cuisine respective to their regions, such as the crêpe station in the Brittany area. There’s also a huge spread of around 40 different authentic French desserts to enjoy after your meal. This is also the only buffet in the city to offer reservations on OpenTable, a huge plus during those busier times when lines can grow long. Cost: Weekday breakfasts at Le Village cost 21.99 for adults and 12.99 for kids; weekend breakfast is $23.99/$14.99; brunch $30.99/$19.99; lunch $24.99/$14.99; weekday dinner $30.99/$17.99; weekend dinner $33.99./$19.99. Special deals: Le Village is part of the Caesars Buffet of Buffets deal where you can gain open-entry to five different buffets for over 24 hours starting at just $54.99. There is also an all-you-can-drink special for $11.99 that includes a variety of different beers and wines. Style of space: Like the buffet, the dining area of Le Village is designed to look representative of a typical village from the same five regions of France. Seating areas range from town courtyards to more intimate cabin settings complete with roaring fireplaces. What’s unique: Paradise Garden features everything you’d expect at a major Vegas buffet, including omelet, sandwich, burger, barbecue, and parfait stations that steadily rotate their selections. Guests can also build their own bloody marys and mimosas. Cost: The brunch buffet is $19.99 M-F and $22.99 Sat-Sun, with kids aged 4-9 eating for $10.99 and those under 4 eating for free. The dinner buffet is a flat $26.99 every night of the week. Special deals: The normal price of admission often includes unlimited bloody mary’s, mimosas, and/or other bar drinks. And like other Caesar properties, their $54.99 pass will let you eat at Paradise Garden (and any other participating buffet) as much as you want in 24 hours. Style of space: Paradise Garden Buffet offers cafeteria-style seating in an open-air atrium. Kids especially will love overlooking the Wildlife Habitat at Flamingo while they eat through floor-and-ceiling windows. What’s unique: Probably neither one of the first resorts nor buffets you might think of first, but Treasure Island’s buffet makes regular appearances in many top Vegas buffet lists. The cuisine is the typical range of most buffets along with specialty American BBQ, Italian pasta, pizza, salads, Japanese sushi, noodle, and country-style bakery stations. On weekends, the buffet switches over to having more of a seafood and prime rib focus for a slightly higher price. Cost: Weekday breakfast is $19.95 for adults and $9.95 for kids; weekend brunch is $26.95/$13.95; weekday lunch is $23.95/$13.95; dinner Monday thru Thursday is $29.95/$16.95; and Friday thru Sunday’s weekend seafood dinners run $31.95/$16.95. Special deals: Unlimited wine, beer, sparkling wine, and mimosas can be added to the above meals for just $12.95 more. The Buffet at TI is also part of a special deal with a few other venues where you can prepay $80 (before your check-in) for a $100 credit that can be posted to your room after you spend the $80. There are also dinner packages that include your buffet meal along with tickets to TI’s Mystère Cirque du Soleil show for $79.95. Style of space: Casual, yet still much more modern than you’d probably find at a buffet back home. Despite having the look reminiscent of an upscale restaurant, it’s still a perfect place to take children and the rest of the family. What’s unique: The Bacchanal is fine-dining meets buffet, and in it, you’ll encounter over 500 different dishes daily, much of it exquisitely prepared and plated by chefs right in front of you. The cuisine comes from nine different kitchens ranging from American, Mexican, Japanese, and more in both full plate sizes and miniature-sized portions of modern cuisine. Since renovating in 2012 with a $100 million budget, Caesars Palace’s buffet has won coveted Best Buffet Awards from outlets such as USA Today, Las Vegas Weekly, and the Las Vegas Review Journal. Cost: Breakfast is $30.99 (for adults) and $14.99 (for kids); weekend brunch is $49.99/$24.99; lunch is $37.99/$19.99; weekday dinner is $52.99/$24.99; and weekend dinner runs $55.99/$26.99. Special deals: Bacchanal Buffet is part of the Buffet of Buffets deal that allows you to eat at several different Caesars properties as much as you want over 24 hours for just $54.99. Style of space: Bacchanal and its 25,000 square foot dining room have a sleek and upscale feel, however, casual dressers won’t feel out of place in one of the venue’s three dining rooms themed after Air, Wood, and Water. What’s unique: Flavors offers just that, a huge selection of tastes from around the world. Of particular note are its churrasco (Brazilian BBQ), hand-rolled sushi, and wood-fired pizza stations. Cost: Harrah’s breakfast buffet begins at $19.99; lunch at $21.99; and dinner at $27.99; and weekend champagne brunch at $26.99. Special deals: Harrah’s offers a dinner-and-a-show package that lets you enjoy both the dinner buffet and The Million Dollar Quartet (an Elvis, Johnny Cash, Jerry Lee Lewis, Carl Perkins inspired show) at a discounted price. Flavors are also part of the Caesars properties Buffet of Buffets pass, letting you eat at as many participating buffets as you can muster within 24 hours for just $54.99. Style of space: Flavors features a lot of earth tones in a contemporary setting on par with other Vegas buffets of equal caliber. What’s unique: Cravings boasts 11 international cooking stations covering the usual varieties of ethnic fare, over 150 Coca-Cola flavors, unlimited beer and wine, carved ham, and custom salads. Overall, the international cuisine seems to be much more authentic as opposed to the more ‘Americanized’ versions found at many other casino buffets. Cost: Average price typically comes between $15-30, depending on time of day and week. Special deals: Unlimited wine and beer are available for all buffet meals, as are takeout boxes so you can eat-all-you-can later, too. Style of space: Craving’s interior was engineered by famous interior designer Adam Tihany. While the bronze-laden pillars and ceiling are modern, perhaps in the architectural sense of the world, the motif still seems more like “Vegas buffet” than anything transformative. What’s unique: The Cosmo’s buffet offering is The Wicked Spoon, which emphasizes serving standard Vegas-buffet fare in non-buffet sized portions so that you don’t feel indebted to eat a lot of something you aren’t crazy for. Servings from the Spoon’s seafood, carving, Italian, dessert and other stations come in little personal-sized baskets and mini-plates. Cost: Average price typically comes between $25-41, depending on time of day and week. 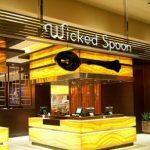 Special deals: Wicked Spoon runs happy hour deals hours daily from 5:00-7:00 PM. Style of space: Spoon’s recessed ceilings, modern furniture, and hanging glass furniture integrate into the look of the rest of the Cosmopolitan effortlessly. The dining room is separated from the actual buffet lines, helping create a stately and quiet ambiance. What’s unique: The Sterling Brunch has been a Vegas staple for decades now. This Sunday-only buffet comes with a slightly higher ticket price, but patrons will be welcomed with bottomless champagne pours, Sturgeon caviar, and exquisite seafood selections you’ll be hard-pressed to find at any other buffet on the Strip. Cost: Bally’s brunch buffet costs $90 or $85 for Total Rewards members. Special deals: The $90 ticket for Sterling’s gourmet selections is widely considered to be one of Vegas’ best deals in itself. Total Rewards members will also receive a $5 discount on their admission price. Style of space: Chic yet romantic, Sterling’s dining room is what you’d probably expect from a champagne and caviar restaurant. Hours: Sterling Brunch is only open on Sundays from 9:30AM – 2:30PM. What’s unique: The Buffet at Aria covers the buffet basics at its nine different stations: Italian, Asian, Mediterranean, Latin, seafood, American diner-style, and so on. However, they also offer a Tandoori oven station, serving up fresh naan as well as a carving station serving a variety of slow-roasted meats. Cost: Weekday breakfast runs $21.99; lunch $25.99; Saturday and Sunday brunch $31.99; Monday-Thursday dinner $36.99; Friday-Sunday gourmet dinner $41.99. Special deals: Unlimited mimosas, bloody Marys, champagne, beer, and wine can be added on to any meal for $16.99. Style of space: The Buffet at Aria lives in a large, brightly-lit room surrounded by contemporary decor. This includes plenty of strong dark colors accented by the wooden pillars and dining tables. What’s unique: This buffet’s specialty is–you guessed it–it’s seafood selection. While you’ll pay a little more to have access to it, you’ll enjoy endless oysters, crab legs, shrimp, and harder-to-find offerings such as fresh lobster. If seafood isn’t necessarily your thing or you don’t want to pay extra, you’ll still find 300 selections inspired by cuisine from around the world, as well as a homemade gelato station, made-to-order soup, and teppanyaki. Cost: Average entree price is $25 for lunch; $32 for brunch; $33 for dinner; and $48 for the seafood dinner. Special deals: Upgrading your meal for just $15 will grant you access to over 70 different fresh seafood items. Locals and Rio Total Rewards members can also regularly find coupon deals such as 25-50% off dinner on the Carnival World & Seafood buffet page. Total Rewards Diamond members will also have access to their own private dining room and also front-of-the-line privileges. Style of space: Carnival offers ample seating ranging from open and chatter-filled to more secluded and quiet in large dining room reminiscent of those on their cruise ships. What’s unique: Feast was voted the Best Brunch Buffet by the Las Vegas Journal Review’s readers. 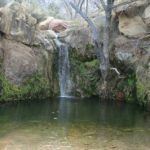 If you can’t make it down to Henderson on a weekend morning, Feast offers the usual selections throughout the week as well as a number of different specialty nights. If you’re a hotel guest, you’ll have access to shorter lines as well. Cost: Cost varies based on time of day and of the week, but lunch buffets can be as low as $8 while the seafood and wine dinner on Fridays will run a little under $30. Special deals: Feast has three different specialty nights: BBQ night on Thursdays ($19.99 with pass); seafood and wine on Fridays ($27.99); and prime rib and shrimp on Saturdays ($17.99). Style of space: Feast has an open, airy, vibe and its tile floors with marble stylings feel reminiscent of a Mediterranean palace. What’s unique: You’ll have to drive a bit down the Strip into Henderson, but the drive to Studio B buffet (inside the M Resort Spa & Casino) is more than worth it for its 200 prepared-daily dishes coming and included all-you-can-drink alcohol and espresso drinks (that’s separate, not mixed together, unless you want to…). Cost: Lunch on Monday thru Friday runs $16.99 for adults and $11.99 for kids 5-8 years old; dinner on Monday thru Thursday is $24.99/$17.99; Friday’s seafood dinner is $39.99/$26.99; and the Saturday-Sunday seafood buffet costs $39.99/$26.99. Special deals: The seafood dinner and buffets on Fridays, Saturdays, and Sundays includes free sparkling wine. All-you-can-drink beer, wine, and espresso drinks are also included at no extra cost for all Studio B meals. Style of space: Amongst super-contemporary decor, Studio B patrons eat in front of giant bay windows provide plenty of natural light as well as a great view. Over a hundred flat-screen TVs also line the room showing everything from the Food Network to live action cooking behind-the-scenes at Studio B.
What’s unique: Main Street Casino’s Garden Court buffet offers a number of specialty nights including BBQ Tuesdays, seafood Fridays, and Prime Rib & Scampi on Saturdays. Cost: Garden Court Buffet is one of the cheaper (quality) Vegas buffets, with weekday breakfast costing only $7.99; weekday lunch at $8.99; Saturday & Sunday brunch at $11.99; Sunday, Monday, Wednesday, and Thursday dinner at $11.99; Tuesday BBQ night at $14.99; and the Friday seafood buffet ranging from $22.99 to $25.99. Note that these prices are for B Connected (Boyd Gaming’s Loyalty Program) members only, however, the program is free to join. Special deals: The $11.99 Champagne Brunch on weekends is one of the most affordable brunch specials you’ll find in Vegas (and that champagne is all-you-can-drink to boot). Style of space: Garden court is just that–a Victorian-type court that feels like you are eating in an old-style (and extremely well-maintained) train station. Bright lighting, brick arches, chandeliers, and high-wood ceilings will overlook you as you enjoy your meal. What’s unique: Amidst all the other standard Vegas buffet offerings is Spice Market’s Middle Eastern/Mediterranean station. In addition to all the tandoori chicken, curry, and baklava you can fit on your plate, you’ll also find a slew of Vegan options here as well. Cost: Price varies by day of week and time of day, but a typical tab is between $25-40. Special deals: As a Caesar property, a $54.99 Buffet of Buffets pass will let you eat at Spice Market and other participating buffets as much as you want in 24 hours. Style of space: Spice Market has a classic diner feel and kids in particular will enjoy the funny food-themed movie posters. Next The Biggest Casino Winners in History: Where Are They Now? 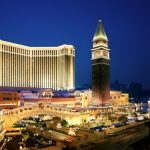 10 Of The World’s Largest Casinos: The Biggest Casinos Ever! 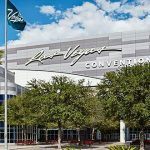 Why Are So Many Conventions Held In Las Vegas?